The Comari SP Pendant Light by Vistosi has been designed by Studio Tecnico Vetreria Vistosi 2002. This transparent blown glass design is made in "rigadin" style. It comes in a topaz diffuser, accented by 24K gold specks. 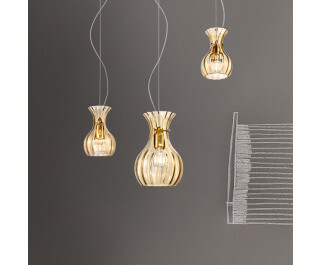 This beautiful light was hand crafted on the island of Murano.